Few people who live outside of Indiana, Michigan, or Ohio understand the vital role manufacturing plays in our region. So I’m constantly looking for ways to demonstrate this fact. 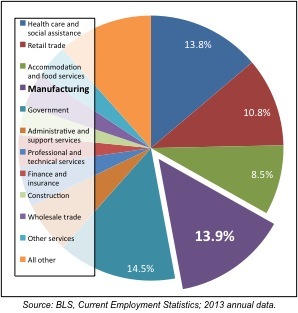 Jobs is the statistic most often used, and all 3 states are in the top ten nationally for the highest share of manufacturing jobs in their economies. But the number of jobs doesn’t tell the whole story. The quality of those jobs, the pay and benefits they provide, is hugely important. And employee compensation is important not only to those who receive it, but also to the economy as a whole – because (of course) this income is then mostly used to purchase goods and services, and those purchases support other jobs. On the macro level, employee compensation thus captures both the number and quality of jobs in each sector of the economy. So, per this metric, is manufacturing very important to our regional economy? You betcha! 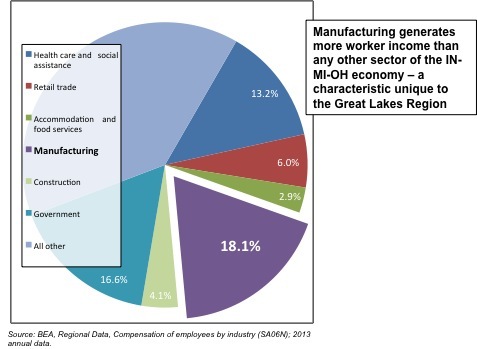 The manufacturing sector is the largest source of worker income in the Great Lakes region, at 18% of all employee compensation. (In other words, 18% of compensation received by all workers in Indiana, Michigan and Ohio is paid out by manufacturing firms.) This is true for no other region of the country. Manufacturing compensation here is greater than healthcare, government, or any other sector of the economy. Individually, the manufacturing sectors in Indiana, Michigan, and Ohio rank #1, #3, and #5 among all states in the share of total employee compensation they generate. In sum, Great Lakes’ manufacturers paid out $129 billion to employees in wages and benefits last year. 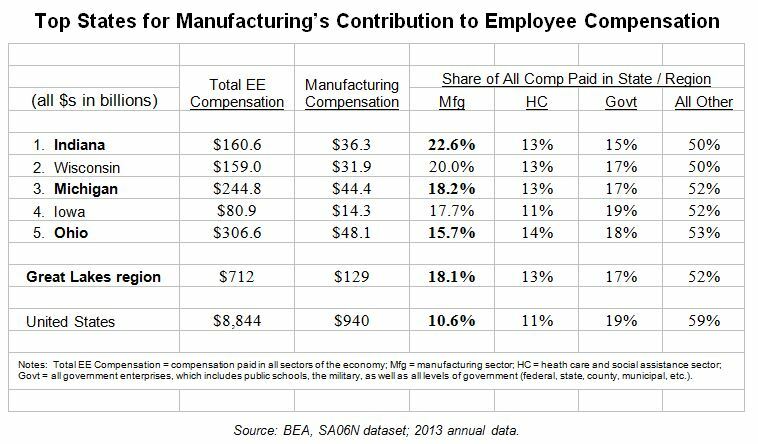 Here’s some context to help put these numbers in perspective: the last time the country as a whole had 18% of employee compensation come from the manufacturing sector was 1990. Remember 1990? The 5 largest U.S. corporations that year were GM, Ford, Exxon, IBM, and GE. (Wal-Mart didn’t make the top 100; Apple was 96th.) Also in 1990, the Dow cracked 2800, the Soviet Union still existed, the World Wide Web had yet to be introduced, and we ran a trade surplus with China. (1990 was also the first season of The Simpsons, which aired on a little-known channel called Fox.) Of course, back in 1990, manufacturing was even more important to the Great Lakes region than it is today. That year, the manufacturing sector was responsible for 29% of all employee compensation. Although Indiana, Michigan, and Ohio have diversified considerably over the past 25 years, manufacturing still drives the Great Lakes economy.